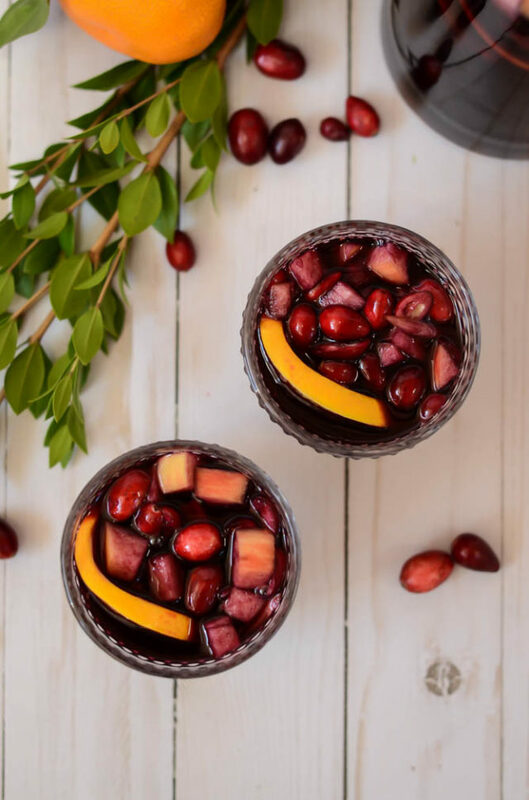 A festive and tasty sangria with both red and sparkling wine, plus loads of fresh citrus and cranberries – perfect for the holidays! Exactly one week until Christmas Eve! How’s everyone’s holiday prep coming along? I’m really proud of myself for how much I’ve been able to get accomplished these past few days. I was able to bake some cookies and have (almost) all of my Christmas presents wrapped and ready to go. If there’s nothing else that this blogging + full-time jobbing have taught me, it’s time management. I’ve found that if I just take a minute to write things down in my calendar and COMMIT, sh** gets done. I’ve always done well with making to-do lists and crossing things off as I go, so I guess this should come as no surprise to me. So, in the same vein, here’s one more holiday cocktail that I’ve been meaning to cross off my list. Do you ever get gifted that bottle of wine (or someone leaves it at your house after a get-together) that you know isn’t of the greatest quality, but you can’t bring yourself to just throw it out? I have quite a few of these that I either acquired during my time living in Napa or through my current job after we hosted a huge wine company on property. I know I’m never going to drink them on their own, but I always tell myself I need to use it up somehow. Naturally, sangria comes to mind. 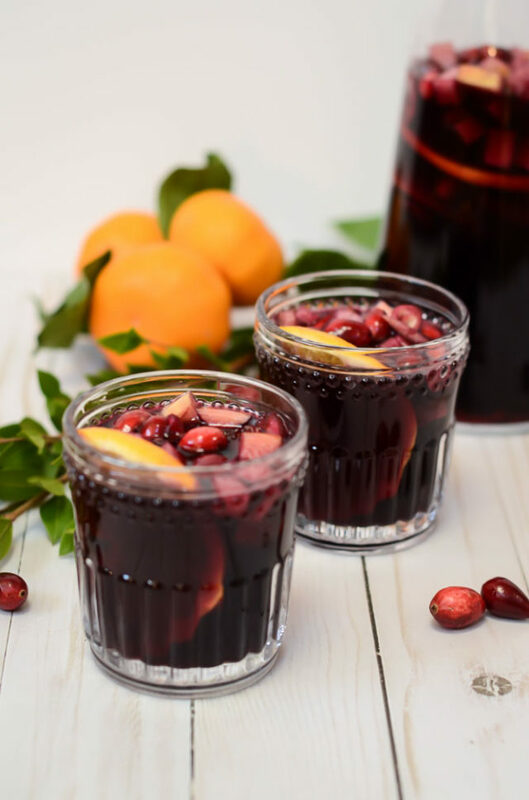 I decided it was finally time to make a Holiday Sparkling Sangria a reality a few weekends ago when we were headed over to a friend’s house for a little holiday gathering. I had so much fall/winter fruit on hand (oranges, apples, pomegranate arils, cranberries) that I figured no matter which sub-par bottle of wine I grabbed from my collection, this sangria would turn out alright. I grabbed a bottle of red wine, and in doing so I also noticed that I had a “throwaway” bottle of sparkling wine hiding in the back of my shelf. I grabbed that too and went on my merry way to the refrigerator, where I pulled out all my winter fruits. I decided to make this Holiday Sparkling Sangria a red wine sangria, because I figured the cranberries and pomegranate arils would make the drink red anyway. Plus, this allowed me to add some “non-clear” booze to really liven things up. I threw in the fruits first and then added the liqueurs and red wine. I topped everything off with the sparkling wine. Now, I was making this for a larger crowd, and I have to admit the sparkling wine got a little more lost than I had hoped, so if you want to bring down the portion size, I’d say omit the bubbly. If you need a batch to serve a crowd, definitely include the bubs. It sure doesn’t hurt the recipe! 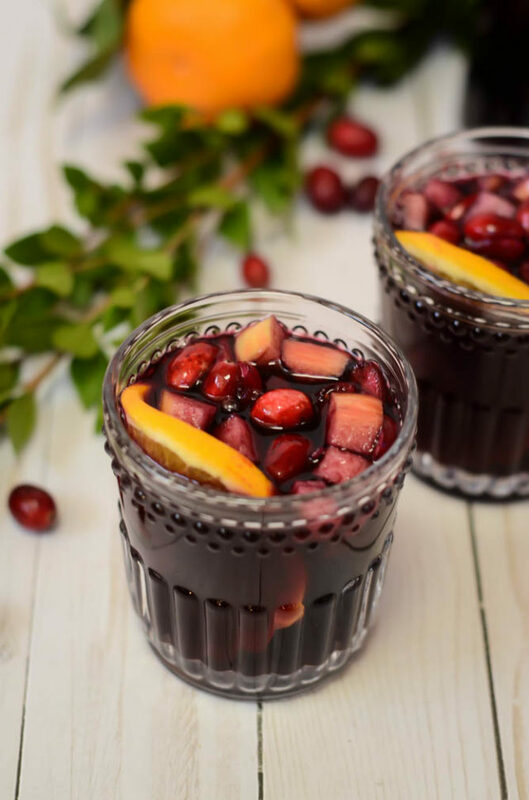 This Holiday Sparkling Sangria is the PERFECT beverage to enjoy with family and friends on Christmas Eve or Christmas Day (or, if sangria isn’t your jam, you could try this Boilo or this Boozy Spiced Hot Apple Cider.) 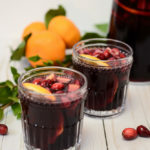 The sparkling sangria is easy because it serves a crowd, is super fruity and delicious (yay for sneaking in the fruits at this crazy time of year!) and it certainly won’t break the bank. What are your favorite cocktails to serve a crowd? I’m looking to expand on our typical wine consumption this year and would love to hear your suggestions! 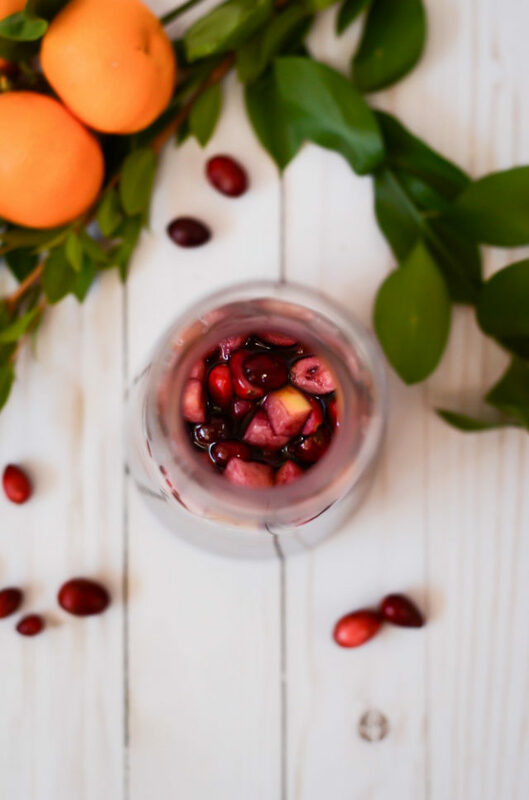 A festive and tasty sangria with both red and sparkling wine, plus loads of fresh citrus and cranberries - perfect for the holidays! 1 750mL bottle of red wine doesn’t have to be fancy! 1 750mL bottle of chilled sparkling wine again, doesn’t have to be fancy! Place all fruit plus fresh orange juice in a very large pitcher or a punch bowl. Add Cognac/Brandy and Amaretto and red wine. Let sit for at least 30 minutes and up to two hours to allow flavors to blend together. Top with sparkling wine and serve! You know what I’ll be sipping on when I’m wrapping presents this weekend!